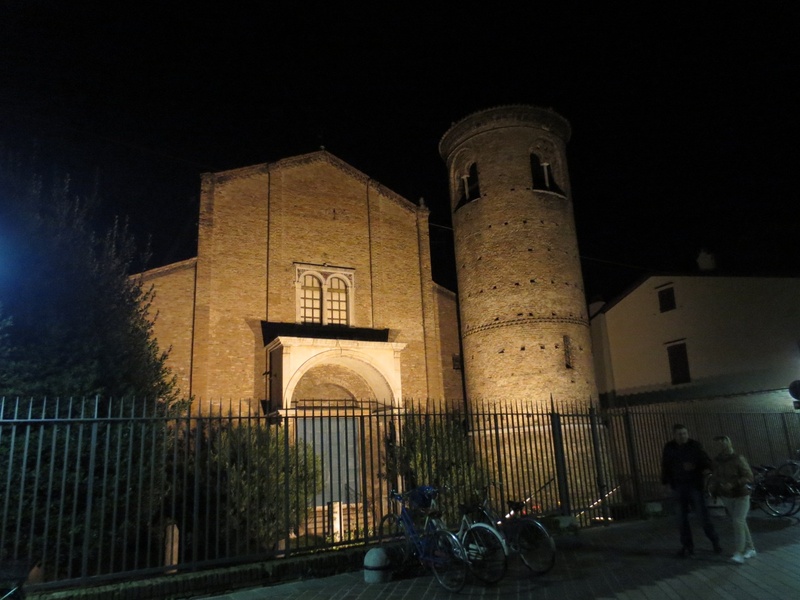 On our last morning in Ravenna, we caught the local bus (number 4) to Classe, south of Ravenna, to see the Basilica of Sant’ Apollinare in Classe. How will we know where to get of the bus, we asked at our hotel? “You’ll SEE it! It’s just fields, and the church…” they laughed. And they were right. 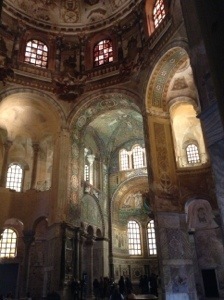 More beautiful mosaics, and a lovely basilica. Saint Apollinaris was the first bishop of Ravenna and Classe. 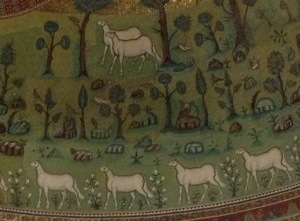 The stylized sheep, in the paradisal landscape. 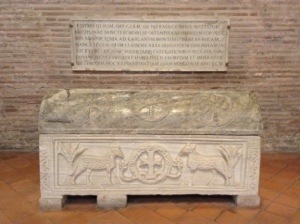 Sarcophagus in the basilica. It was lovely and quiet. On to more mundane things: we got some groceries for lunch, for the train rise back via Bologna. 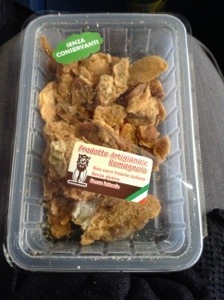 Bread, some runny gorgonzola, and this mystery box which turned out to be something like pork scratchings. 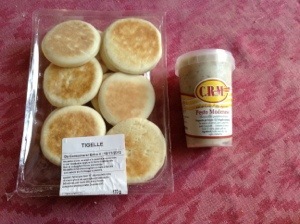 We had time in Bologna between trains, so my husband braved the rain to get these tigelle and pesto modenese. We discovered them on a Bologna weekend and could not resist the chance to get some more. Tigelle are a small disc-shaped bread, also called crescentine, and they are so delicious when lightly toasted, split and served with a light touch of pesto modenese. That is a mix of lardo (high quality cured fatback) with rosemary, garlic, salt. Perfect appetizer for non-vegetarians (also nice with our leftover gorgonzola). Living in Rome and having the possibility of a weekend like this one in Ravenna is wonderful, it makes me really appreciate how lucky I am. Italy is so diverse in food and sights and culture, and there is always more to explore and learn. A weekend is not enough, but it is a start, and Ravenna is certainly a place I’d be happy to go back to. This entry was posted in Italy, travel and tagged Emilia Romagna, Ravenna on October 21, 2013 by krumkaker. Mosaics from the ceiling Mausoleum of Galla Placidia, Ravenna. This was last Sunday, and it was a lovely sunny morning. San Vitale was closed for mass so we non-Catholics went around the corner to see the Mausoleum of Galla Placidia, another of the UNESCO World Heritage sites, with mosaics from 430 AD. It looks very simple from the outside, and then you step inside and see the most amazing Byzantine mosaics and colours and images. 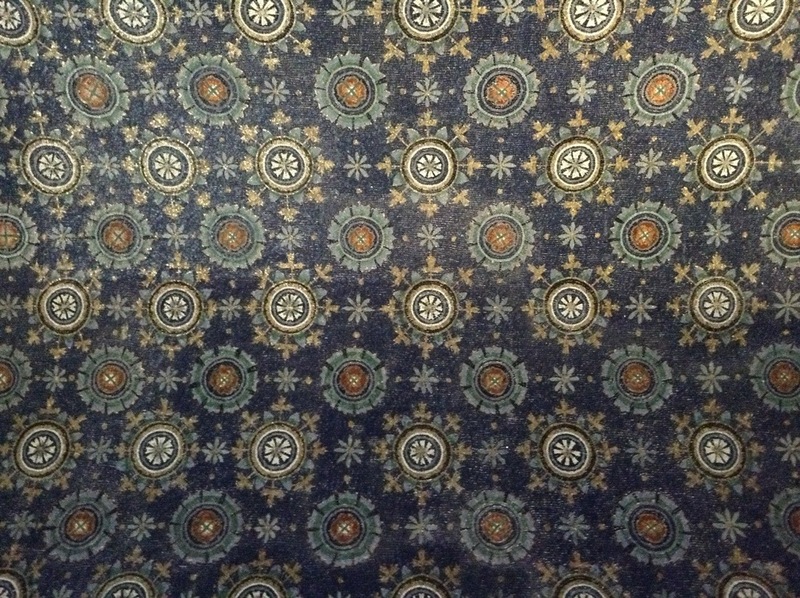 Our guidebook said that Cole Porter wrote “Night and Day while on honeymoon in Ravenna in the 1920s, when thinking of the starry sky of Galla Placidia. Ravenna has a joint ticket for the key attractions (the Battistero della Neoniano, Archepiscopal Museum/Chapel of San Andrea, Church of San Vitale, Mausoleum of Galla Placidia, and Basilica di Sant’Apollinare) so we strolled around town to catch a few before lunch. 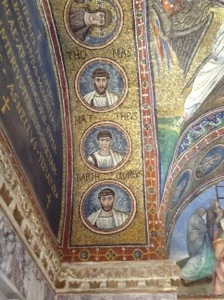 From the chapel of S. Andrea, a picture for our friend Matthew. More apostles. 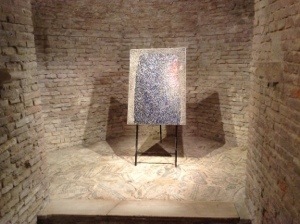 The Chapel of St. Andrea is accessed through the Museo Arcivescovile. 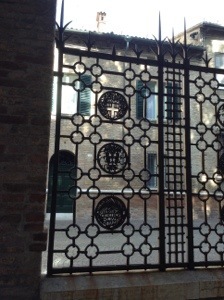 Gates near Dante’s tomb. It was surprisingly quiet; some tourists (many Italian) but very peaceful. Much of the center of Ravenna is pedestrian, and it is very flat (good for limited mobility) and the locals seem to bicycle everywhere. After the noise and bustle of Rome with scooters and honking cars, Ravenna on a Sunday morning was just an oasis of peace. 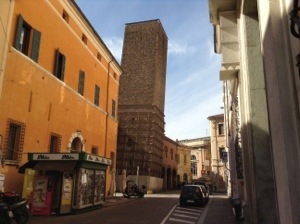 I had no idea that Ravenna has leaning towers too. 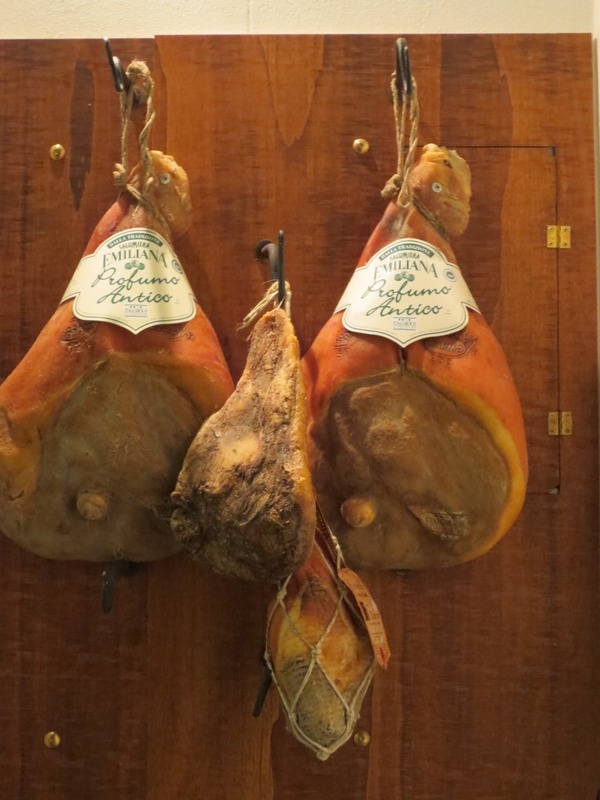 We are heading to lunch at Antico Trattoria al Gallo (Via Maggiore, 87). I’d been debating where go to for a proper Sunday lunch, and had been cross-referencing Chowhound, Italian message boards and other resources, and we were delighted with Antico Trattoria al Gallo. Best to book on a Sunday. Capelletti with shavings of fresh truffles, and my carbonara with pesce spada. It was made with smoked swordfish instead of guanciale, which seemed odd but interesting, and it was just lovely. Will have to try that at home. 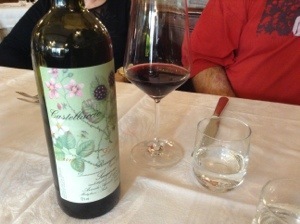 A local liqueur “Feuilles de cerises” (there is a French influence) made from infusing wild cherry leaves in cabernet-sauvignon….. Delicious! An amaretti semifreddo affogato al caffe, and some biscuits. And some food for the soul. 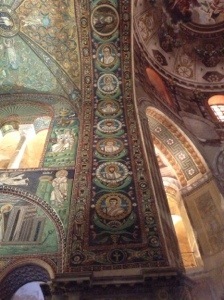 Basilica di San Vitale: Incredible Roman and Byzantine mosaics, in gold and green. We’d been in the evening before for a concert, but it was all dark, just with lights on the musicians on the gallery. 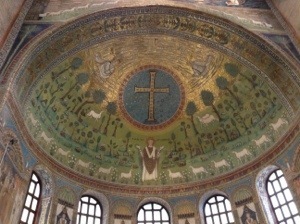 Seeing it in with the afternoon glinting on the gold mosaics was wonderful. It’s an octagonal church, which is unusual. Another lovely day. And we still had Monday morning to explore more, before getting the train back to Rome. Life is very good indeed. This entry was posted in Italy, travel and tagged Emilia Romagna, Ravenna on October 20, 2013 by krumkaker. 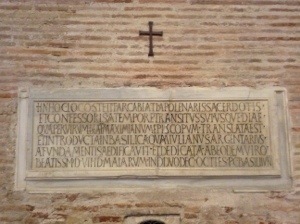 Last weekend we went to Ravenna. It is in Emilia Romagna, east of Bologna and south of Venice. 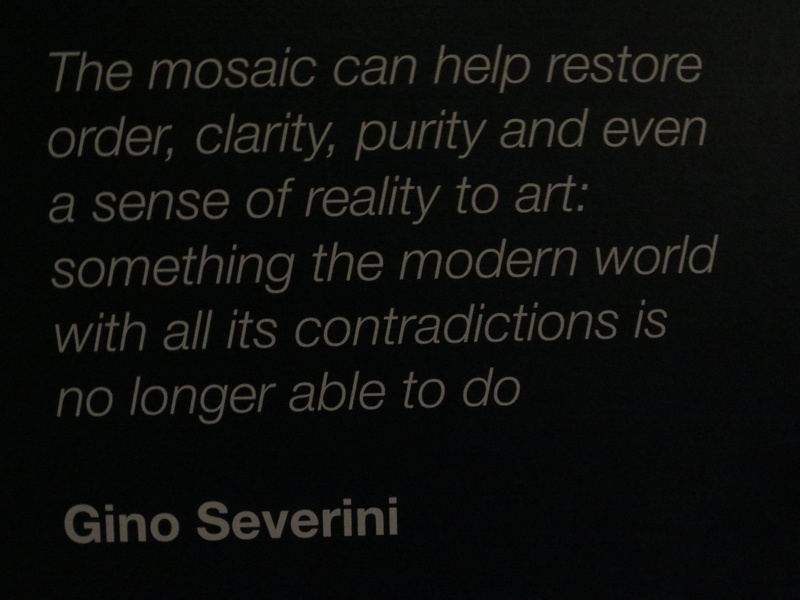 I had always heard there were beautiful mosaics there, but had never been there before. It was easy enough: fast train to Bologna (two hours from Rome), then a slow local train to Ravenna (80 minutes). 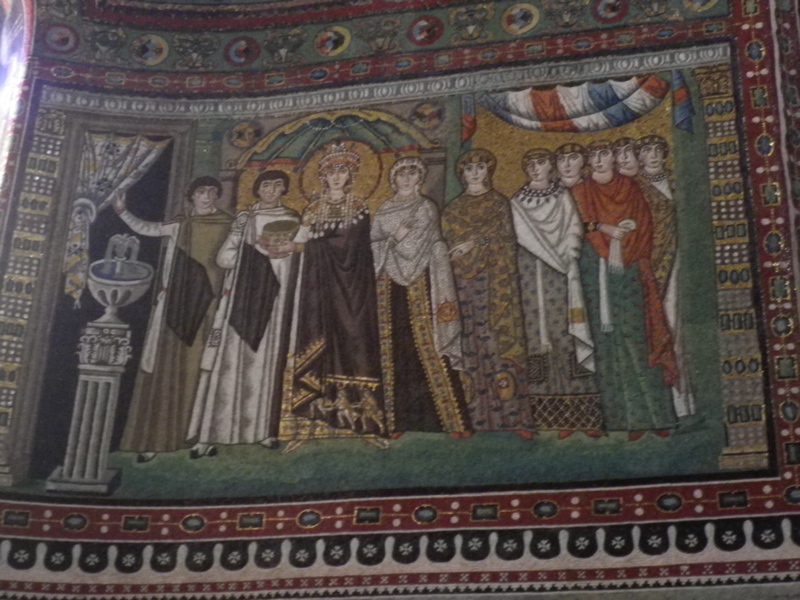 The mosaic above is in the Basilica San Vitale, depicting the Empress Theodora. 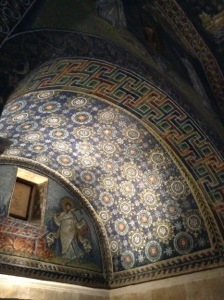 Ravenna has eight UNESCO World Heritage Sites. 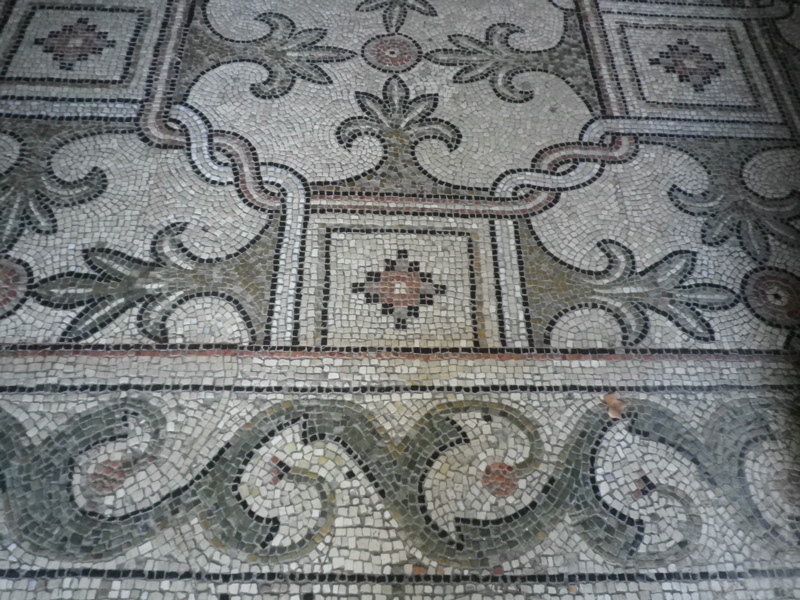 Mosaic floor, Basilica San Vitale. 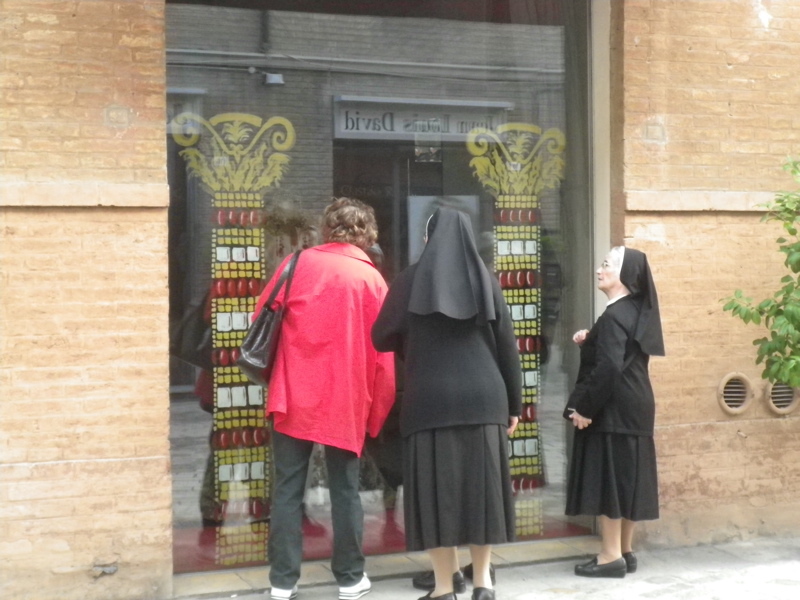 Via di San Vitale: window-shopping nuns? 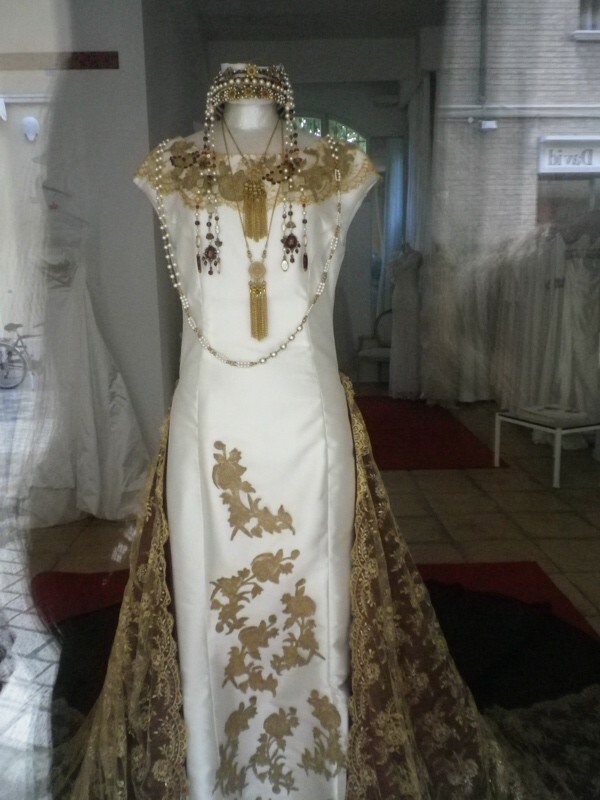 No, the nuns were looking at this fabulous Empress Theodora-inspired wedding dress in the shop window. Can you blame them? More window-shopping. Emilia-Romagna is in Northern Italy, and you’ll find Bologna, Modena, Parma, Ferrara and Rimini here. The food was quite different from Rome, and delicious. 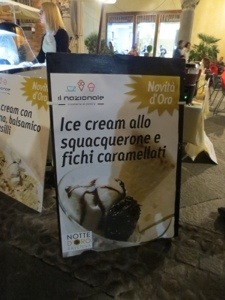 What we did not know was that the night we arrived (12 October) was the Notte d’Oro, the Night of Gold. Like the Notte Bianca in Rome: concerts, museums open late, and hordes of people. Squacqerone is a local soft, fresh cheese. This was also the opening weekend of a mosaic festival, so through the weekend we encountered modern mosaic pieces among the ancient sites. Quite an interesting juxtaposition. 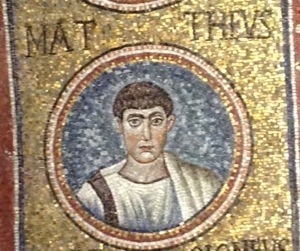 There were masses of people out, concerts in the piazzas, and we finally sought refuge at the mosaics exhibit at TAMO. Museum were open late that evening, and it was lovely and tranquil there. This is from the exhibit. On our way back to the hotel, we passed the wedding shop again. 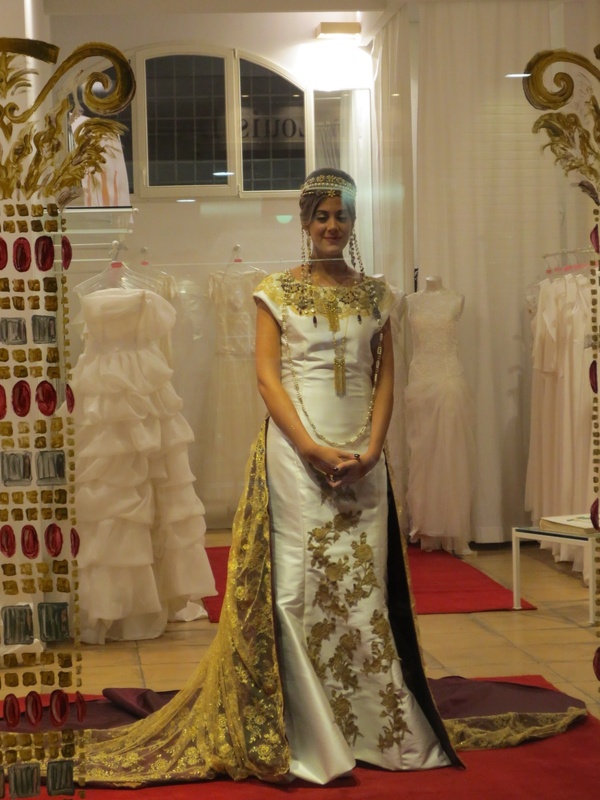 Lo and behold, as it was Notte d’Oro: a beautiful live model in the window, wearing the Empress Theodora wedding dress! This entry was posted in Italy, travel and tagged Emilia Romagna, Ravenna on October 19, 2013 by krumkaker.